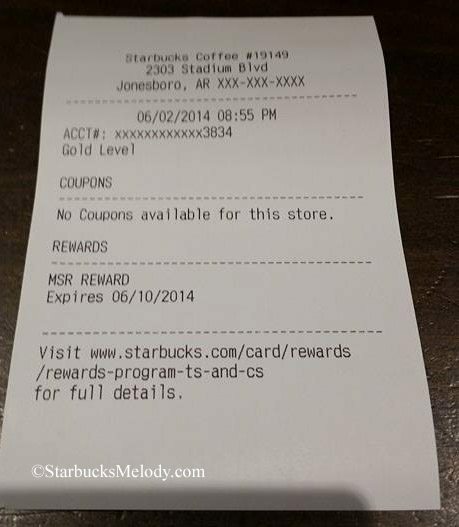 Starting very soon, you’ll be able to check your rewards at the Starbucks register. Many stores have already updated their system to add that functionality, and soon every store will be able to do this function. 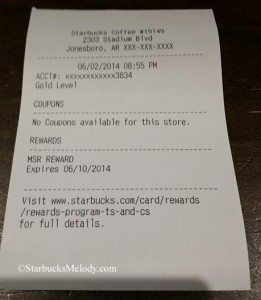 You can hand your registered, loaded Starbucks card to a Starbucks partner, and he or she will be able to tell you if there is a reward available on your Starbucks.com/card profile. Now is a good time to mention a few important points about this. The ability to swipe a card and look up rewards is a functionality only available at company-operated Starbucks. Generally speaking (there are occasional exceptions), any Starbucks inside another business (such as Starbucks inside a Safeway or a Target store) is a licensed Starbucks. A free-standing Starbucks is almost always a company-operated Starbucks. All of your rewards are associated with your profile at Starbucks.com. This means that ANY card you swipe which is registered to your profile should reveal available rewards, assuming that you have earned rewards available. Once Starbucks.com/card profile reaches the Gold level, every twelve stars you earn a “Lucky Dozen,” reward, good for food or beverages. (Beer and wine are not available as free reward beverages, and Evenings Food is excluded). This is a much-needed functionality! Now it is even easier than ever to track your Lucky Dozen rewards. Also, if you have a Birthday Reward available, that should show up too. Great news! About time this was implemented. Although I keep an eye on my rewards, it is nice to have it available. This morning I asked a partner about this new functionality and as often before she looked at me like I had two heads! She had no clue as to this upcoming option. I love the new function of ALL registered card rewards will appear, although I use only one I know many folks that have several! @Purple1 and @Leslee – That’s funny! I’ve mentioned to partners now and then, don’t assume your customers don’t know much – if they’re active on social media and fan sites, they’ll know a lot! It’s true, Starbucks customer can know an enormous amount Starbucks! @IzzyJ – This is worth a “Hooray”! Thank you! Awesome. We have needed this for a long time. The next improvement would be a “split check” button for those people in line who order five things and then tell you at the end or at the DT window they want them all as separate transactions. When this POS system was displayed at the New Orleans Management get together a long time ago, they asked for any comments for improvements. I told them they needed a “split check” function included. The young woman asked me what that was and I explained it to her. Then she asked me what we would need that for and I explained that to her. This is a function that many customers have apparently been wanting for quite some time, so for that reason I think it’ll be a good thing. It doesn’t affect me because I always keep track of my rewards etc on MSR. The one and only downside that I can see of this is the (hopefully) rare customer who will argue about the accuracy. I see one or two of these types nearly every day…..insisting they were charged too much, their balance on the receipt is incorrect etc. So, I can see the same type argument going on about their number of rewards. Too bad. @Melody: I meant to post earlier about your infamous long drive! 1200 miles is a distance I gave up quite a few years ago. But I commend you: if you can do it, do it. Much unlike our unbelievably harsh, long winter we are now having some glorious bright days and generally, not too warm. I grew up and spent most of my life in Chicago and even through blizzards and just some rough winters, (which I’ve loved 🙂 this past one really took the cake. In any case, I’m hoping much of the country is getting to enjoy some weather like this! oh! that give-away you recently did? Never ceases to amaze me! The number of people who enter so quickly is ???? It would be nice if a fraction of them took the time to read and post here on at least a semi-regular basis! @Denise – They’re lurkers. I’m always amazed too. This blog has thousands of visitors every day – And as with most blogs, more than 99% of the people come to read one article, and leave. Yes, I would LOVE to get lurkers engaged here. And would love it if some of them bought my book! This just started at my store yesterday. What a relief! I always hated telling people I couldn’t check to see if they had a reward until I rung them up. And it makes our jobs easier because if there are coupons associated with the account, it shows us those too, along with the code to ring it up correctly. I’m loving having all the info in one place. Before, customers would come in and say “I have a coupon for $2 espresso drink.” I would say “sure, I just need the coupon code”…then they would have to dig through emails to find it, I would put it in, then say, “ok, now I just need the barcode of the card associated with this email”…longest process ever!!! So grateful it’s now streamlined. I’ll echo the “about time’. There are so many functionality features of the Rewards Program that Starbucks has neglected (add the websites and Apps to that too), IMHO very poor consultants providing guidance. Starbucks gets better advice from their customers, just too slow to listen. It tightens my jaw to see so many people only show an interest in your site when you give something away. As a regular I feel that I am lowering myself to the selfish masses. @Amanda – I went to my local Starbucks this morning. I forgot to bring in the coupon code. The partner checked the printout, which listed I had the coupon, but we were both surprised to find out that the register printout did not give the code. After looking in my bag, the good news is that I was able to find the code. What I did not realize until after I left is that the MSR info prints out on a separate piece of paper, not on the receipt. Now I wish that all Starbucks inside of places like Target and grocery stores would honor the free rewards on the card. This is great news. Slowly but surely they are listening to the customers and fixing problems.